Fashion Roundtable Panel: Fash-Tech, Disrupting Business Models, AI Innovations & Fashion Futures. Want to understand the future of fashion and how to integrate disruptive innovation successfully into your business? Scared of all things tech, yet need to have the expertise? Keen to make your business more inclusive (and appealing to new markets) with informed strategies? Tamara Cincik CEO and Founder of Fashion Roundtable on Al Jazeera to discuss the legacy or legendary designer Karl Lagerfeld on the sad news of his death. Tamara Cincik from Fashion Roundtable was interviewed by Sky News on the concerns of the fashion industry from Brexit. WARDROBE CRISIS Podcast Ep. 67, Tamara Cincik, Fashion & Politics - Brexit & The Environmental Audit Committee (EAC). Fashion Roundtable 1st Anniversary x Bistrotheque x Brexit - the panel, led by Tamara Cincik, discusses the importance of London’s reputation as a fashion hub and whether Brexit puts it at stake. Tamara Cincik joins Agnes Cazin and guests to talk about fashion and diversity on H73 Podcasts. Jessie Brinton Writer and Former Features Editor at Sunday Times Style. 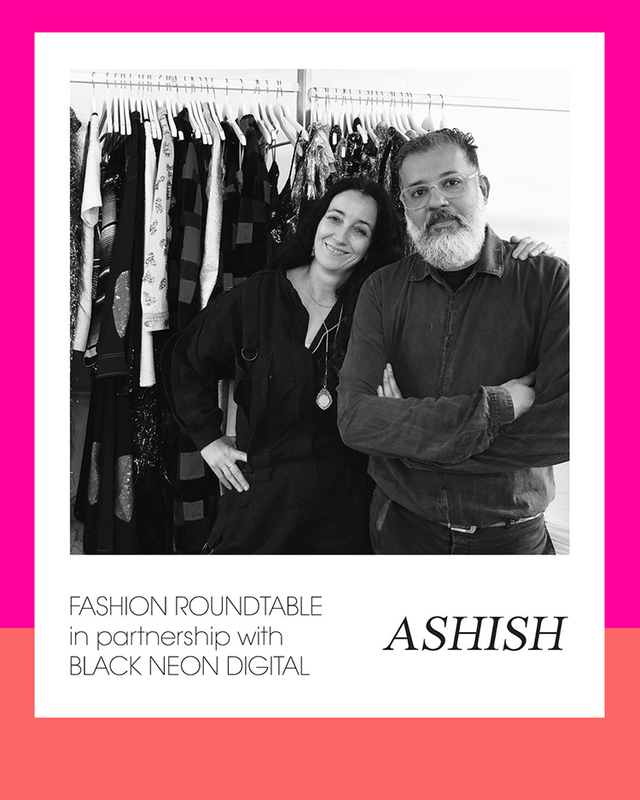 In this podcast Ashish Gupta (founder of luxury fashion brand ASHISH) and Tamara Cincik, CEO & founder of Fashion Roundtable discuss how an immigrant from Delhi, who was educated at Central St Martins, has made a successful fashion business in the UK despite extremely challenging economic environmental circumstances. What can fashion do to feel more positive about body image? What does your Identity mean to you? What can fashion do to reach into the markets it is not collaborating with? What does Influencer mean to you ? Lou Stoppard chairs a panel on the repercussions of the Brexit vote on the fashion industry, joined by Nick Knight, Fashion Roundtable founder Tamara Cincik, adviser Munira Mirza, CEO of the UK Fashion & Textile Association Adam Mansell and designer Phoebe English. Nick Knight: "There are certainly people in Westminster who don't see it your way, who want to take up the drawbridge and have a little England." Tamara Cincik, Eszter Kantor, Samuel Nicholls, Navjyot Lehl and Karen Binns further discuss the effects of Brexit on the Fashion Industry, as part of the Fashion Roundtable Initiative. In-keeping with SHOWstudio's ethos of international awareness and our reach to a global audience, Nick Knight opens conversation into the repercussions of the Brexit vote on the fashion industry. Eszter Kantor: "Think about what you are going to do with the freedom. And freedom is a lonely thing. Freedom is ultimately perceived as isolation." Lisa Cameron MP, Chair of the APPG for Textiles & Fashion: question to the Prime Minister on the consideration of fabric and fashion industries post Brexit. Dr. Lisa Cameron MP: "The UK’s textile and fashion industry contributes £28 billion annually and textiles are a significant contributor to our Scottish economy. I am chair of the all-party group on textile and fashion. The industry is concerned about the passporting of goods and of highly specialist services, so how does the plan protect creative industry services? Will the Prime Minister do this and ensure no fashion faux pas going forward?" There are still many unknowns about what will happen to the fashion industry after Brexit. We intend to turn the unknowns into a way forward. Watch our Brexit and The Impact on the Fashion Industry Paper launch filmed at SHOWstudio. "Our analysis together with Assay Corporate Finance puts a Hard Brexit at a 38% loss to GDP. We have over 90% fashion SMEs (thats's small to medium sized enterprises in the UK and I don't think they could take that hit." Sustainability and Geopolitics Event @ Push PR 23/05 speakers: Anna Fitzpatrick - Sustainability Expert at Fashion Roundtable and works at the Centre for Sustainable Fashion at UAL, Richard Malone - Designer, Bethany Williams - Designer , Orsola de Castro - Creative Director and co-Founder of Fashion Revolution, Daniel Hatton - Founder of the Commonwealth Fashion Council, Christina Tiran - Project Manager at The Sustainable Angle. Richard Malone: " I think it takes education, as if you know it takes 2 hours to make a shirt and you are paying 10 Euros, someone is losing out." Ethnic Representation in the Fashion Industry Event at Push PR. Speakers Karen Binns Fashion Roundtable Fashion Expert, Kenya Hunt, Deputy Editor & Fashion Features Editor Elle UK, Karen Alexander, Eszter Kantor, Natasha Sivanandan, Rahemur Rahman, Frederica Boateng. The fashion industry employs over 880,000 people in the UK and generates upwards of £28billion for the economy, but is its voice being heard over Brexit? Listen to Tamara Cincik speak to the Brexit Podcast.